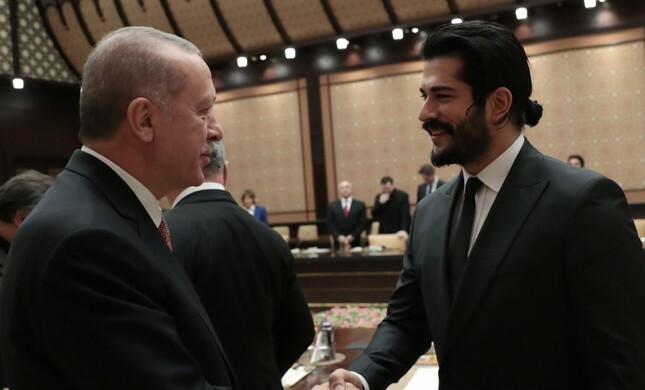 President Recep Tayyip Erdoğan on Tuesday met with representatives from the cinema sector at the Presidential Complex in Ankara. The meeting lasted one hour and 10 minutes. Some of the cinema sector's biggest names were present at the meeting, which included over two dozen representatives. Producers Muzaffer Yıldırım, Birol Güven, Şükrü Avşar, Raci Şaşmaz, Elif Dağdeviren, Onur Tan and Timur Savcı attended the meeting, along with prominent actors Şahan Gökbakar, Yılmaz Erdoğan, Ata Demirer, Oktay Kaynarca, Demet Akbağ, Raci Şaşmaz, Burak Özçivit, Bülent Inal and Tamer Karadağlı.